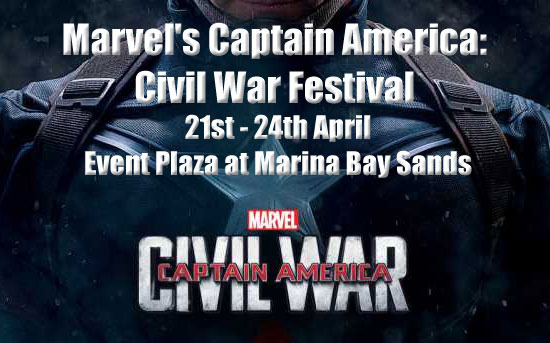 Good news for Marvel fans in Singapore as there will be a Marvel's Captain America: Civil War Festival from 21st to 24th of April 2016 at Event Plaza at Marina Bay Sands!! Not only that! Team Cap, led by Chris Evans, will head to Singapore to meet fans and media on Southeast Asia Blue Carpet & Premiere, taking place on 21 April 2016. Singapore will play host to Chris Evans (Captain America), Sebastian Stan (Winter Soldier), Anthony Mackie (Falcon) and director Joe Russo. Over the 4-day festival, Event Plaza at the Promenade, Marina Bay Sands, will be transformed with exciting activities including cosplay competition, photo contest, themed activities, complimentary screening of Marvel movies by the bay, complimentary combat workout sessions and more. Marvel’s Captain America: The Winter Soldier and Marvel’s Avengers: Age of Ultron will be screened on 21st and 23rdApril respectively at 8.15pm. The festival is organized by the team behind the annual Singapore Toy, Game & Comic Convention (STGCC), in collaboration with ReedPOP – the force behind Star Wars Celebration, New York Comic Con, and PAX, and supported by the Singapore Tourism Board. 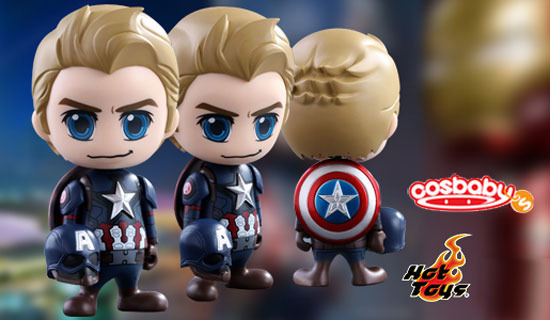 To commemorate Captain America’s arrival in Singapore, a limited edition Hot Toys Steve Rogers Cosbaby Collectible, produced by high-end premium collectible brand, Hot Toys, and Marvel’s Captain America: Civil War T-Shirt, designed by local company, O-WOW, are available exclusively at the festival in limited quantities. More information on how to get the exclusive merchandise is available on the festival website. The fans and public can also join in the fun online through the festival’s photo contest by posting a photo of themselves striking a Super Hero pose against a Singapore iconic landmark on Twitter, Facebook or Instagram to win autographed movie merchandise. For more details on the Marvel’s Captain America: Civil War Festival, please visit www.teamcapfestival.com.sg.